ARTICLE: What works in motion graphics? A study by Spencer Barnes, of University of North Carolina at Chapel Hill, investigated how different motion graphic structures affect user experience. Barnes conducted an experiment with 82 US college students, who were exposed to variations of two different motion graphics. The students then answered questions that measured, for example, immersion and comprehension. The classical “EIPR” structure was found to be best overall. It consists of four narrative elements, or shots: the establisher, initial, peak, and release. In terms of comprehensibility and cognitive load, complete animations were clearly better than any of the truncated versions. In some cases, however, omitting elements resulted in slightly better results. Motion graphics without the “release” element (i.e. condition “EIP”) was found to be the most immersive. Even animations with neither establishers nor releases (condition “IP”) were more immersive than full EIPR-animations. Interestingly, the “IPR” condition (with only the “establisher” element omitted) was the least immersive version – losing to both complete animations and other alternative cuts. The results support the notion of the EIPR formula’s superiority in most uses. The differences between the non-“canonical” animations were nonetheless interesting: EIP was most immersive, IPR most comprehensible, and IP most viewable. This suggest the need to carefully consider the purpose of a motion graphic prior to settling on a narrative structure, Barnes concludes. The article “Studies in the Efficacy of Motion Graphics” was published by the journal Digital Journalism. It is available online (abstract free). 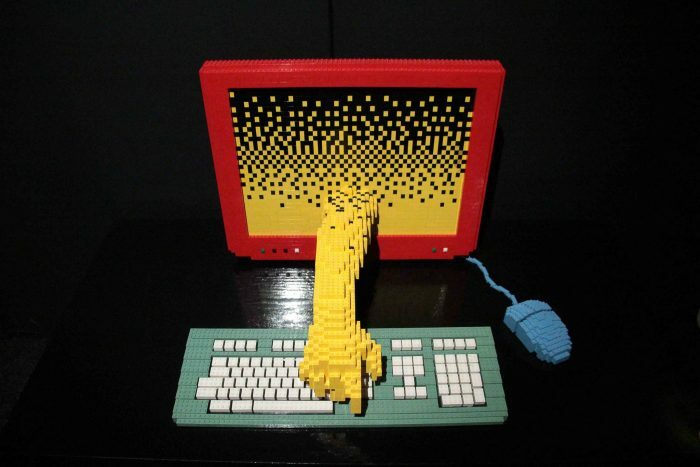 Image credit: Computer by Nathan Sawaya, photographed by Maureen Barlin, photograph licence CC BY-NC-ND 2.0.